What is an itchy back? An itchy back is itching isolated to the skin on the back – between the neck and buttocks. It may or may not present with a skin rash. An itchy back is a common occurrence that is often not related to any underlying skin disease or other medical condition. Many cases of an itchy back are a consequence of poor hygiene, excessive sweating on the back and irritation by clothing. However, there are several skin diseases which tend to occur on the back thereby causing itchiness of the skin. These conditions may not be solely isolated to the back and lesions may be seen elsewhere on the body as well. It is therefore important to differentiate between the occasional episode of an itchy back and persistent itching that is ongoing for weeks and months. The presence of a skin rash, bumps and pimples are also useful indicators of whether an itchy back is just a temporary irritation or due to an underlying skin disease. Discoloration of the skin on the back – dark (hyperpigmentation) or light (hypopigmentation). The skin on the back is thicker than the chest, abdomen or flanks and has fewer nerve endings than these areas meaning that it is less sensitive. Therefore a stronger stimulus (irritation) is needed to cause itching. There are various causes of an itchy back related to hair products, skin applications, skin diseases and other medical conditions. A very common cause that is often missed is poor hygiene. The back being a more difficult place to reach is often not washed as thoroughly as other parts of the body. Over time this can contribute to itchy skin. Hair care products are among the leading cause of an itchy scalp, neck and back. During bathing, water from the hair dripping down the neck and back makes contact with skin on the back thereby causing reactions that are similar to those on the scalp. This condition is known as irritant or allergic contact dermatitis, with the irritant or allergen in these cases being the shampoo, conditioner or hair dye. Most shampoos and conditioners are thoroughly tested and less likely to cause skin reactions, except in a person with an allergic predisposition. Hair dyes however are common skin irritants due to the presence of a chemical known as paraphenylenediamine (PPD). Read more on hair dye allergies. Skin applications such as creams and lotions may also cause contact dermatitis. However, most of these products are thoroughly tested. Creams and lotions with a fragrance (scent) are more likely to be irritants than fragrance-free (unscented) varieties. Specialized products such as tanning lotions and sunscreen creams may irritate sensitive skins. The back has to contend with significant pressure and less surface air circulation when lying down and some skin care products may form a thick barrier over it thereby contributing to itchiness or a heat rash. Scratching in turn worsens the condition as there is further irritation and micr0-abrasions that may develop on the skin surface. Clothing may irritate the skin for various reason. It can be related to chaffing with excessive movement particularly with clothing of a rough texture. Excessive perspiration on the back may also cause clothing to be damp for long periods, clothing that is washed with strong detergents or fragranced products and certain synthetic fibers may cause irritant or allergic contact dermatitis. Clothing made of certain fibers and thermal clothing may cause overheating and therefore a heat rash (miliaria). 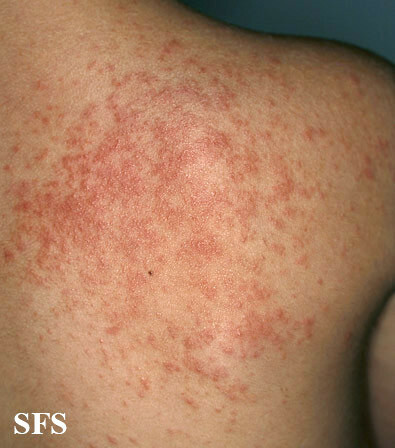 Miliaria (heat rash). Picture from Dermatology Atlas, Courtesy Samuel Freire da Silva M.D. Dry skin is a common occurrence in life but with healthy skin it is just temporary. The skin secretes natural oils to moisturize the skin surface and the water content in the underlying layers of the skin are maintained with the barrier function of skin. However, when the skin secretes less oil and its waterproof surface is compromised then skin dryness becomes apparent. Chronic dryness (xerosis) may occur with age-related skin changes, exposure to harsh soaps, chlorinated pool water and various skin diseases. Sunburn arises with intense and prolonged sun exposure particularly without clothing. The skin typically appears red, darker than the normal complexion and has a burning or stinging sensation. However, even short term exposure or sun exposure on a cloudy day can cause very mild sunburn that may not seem typical in presentation. This can occur even through thin clothing. Itching is a common as the burning sensation subsides. There back is one of the common sites for the development of acne vulgaris and is often referred to as bacne. This occurs when the pore of the hair follicle becomes blocked subsequently leading to the formation of pimples. This may initially be seen as whiteheads or blackheads (comedones) and progress to other skin lesions like flat topped plaques, pus filled cysts or even an abscess (boil) although a pimple is the most common presentation. Back acne frequently occurs with acne on the face, chest and shoulders. It is more common in teens but can also continue or even start in adulthood. The pimples are often painful but an itchy back is a common symptom as well. Back acne. Picture from Dermatology Atlas, Courtesy Samuel Freire da Silva M.D. 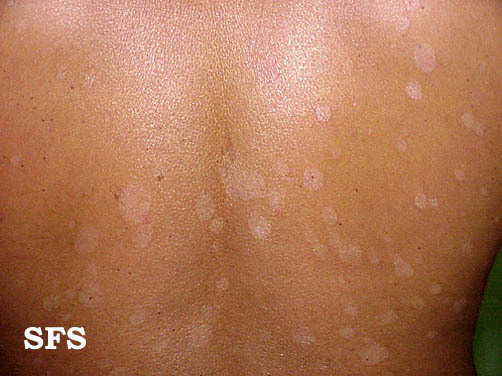 Tinea versicolor on the back. Picture from Dermatology Atlas, Courtesy Samuel Freire da Silva M.D. 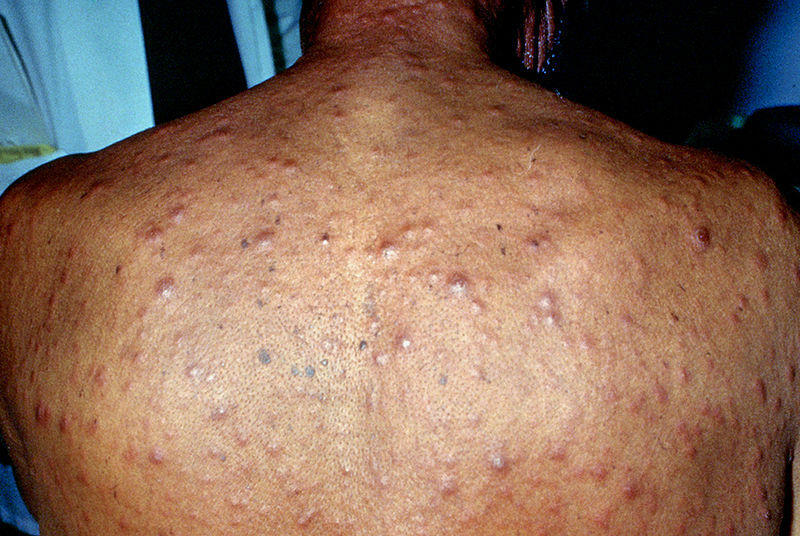 Secondary syphilis rash on the back. Picture from Wikimedia Commmons. Atopic dermatitis, often referred to simply as eczema, is an itchy skin disease associated with an abnormal immune response to certain allergens. It is more commonly seen in early childhood and can continue into adulthood. The skin is typically dry, rough and red. Repeated scratching may cause the skin to peel off and bleed. Itching is generally worse at night. Although the exact cause of atopic dermatitis is unknown, it seems to be triggered with exposures to certain allergens. It also appears to be linked to hay fever (allergic rhinitis) and asthma in childhood. Neurodermatitis is a chronic itchy skin disease that may arise after skin injury, insect bites, with skin diseases, for psychogenic reasons or may occur due to no known cause. The persistent itchiness causes a person to scratch thereby injuring the skin and leading to darkening and thickening of the skin. Repeated scratching also increases the chances of skin infections, particularly bacterial or fungal, which may further contribute to the appearance. Last updated on September 1, 2018.